Screenshot from Arwa al-Neami’s video on Saudi women in an amusement park, Never Never Land. Saudi Arabia’s government bans women from driving. 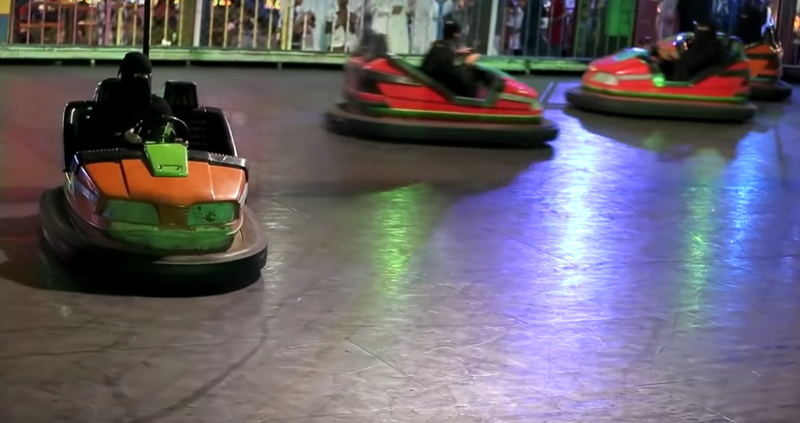 But Saudi Arabia’s women have found a way around it: bumper cars. Others regard time spent in a brightly colored open-top vehicle with a hot rod attached to the ceiling as a serious practice session. Many more women were happy about how much they could relax in these amusement parks, some staffed only by women, others with mixed genders but also a large curtain entirely surrounding the bumper cars rink. Saudi Arabia’s ban on driving is just a piece of the country’s strict, conservative laws. The amusement park and its driving is an escape from it all. The driving ban is still unbelievably backwards, and it still stands as Saudi Arabia’s crown prince recently declared the country ‘not ready’ for women driving. Saudi Arabia’s women appear to disagree.